What is LCA Tejas ? Primary Objective Of LCA Tejas Program. LCA Tejas Development Agencies DRDO , HAL And ADA. LCA Tejas Project Approval And Development Phase. Development Of Indigenous Kavari Engine for LCA Tejas. What is New in LCA Tejas MK1 A ? Why HAL Selected Israeli Elta EL/M-2052 AESA Radar for LCA Tejas ? Why MBDA Developed Meteor Missile Not Integrated with LCA Tejas. The MCA Tejas MK2 Design Features And Status 2019. What is Light Combat Aircraft LCA Tejas ? The LCA Tejas is an indigenous Light Combat fighter aircraft being designed and developed by India DRDO for Indian Air Force. The Indian Air force mainly operates Soviet built fighter planes such as MIG 21 , MIG 23 and other fighter planes which are on the verge of retirement and needs to be replaced with latest fighter planes. The LCA Tejas program was launched mainly to replace these Soviet-era ageing planes . However, Tejas programme is lagging behind the schedule despite the development efforts of three decades. The LCA Tejas is being designed and developed by HAL ( Hindustan Aeronautics Limited ) and ADA ( Aeronautical Development Agency ) both lead agencies to develop LCA Tejas . LCA Tejas is Indias indigenous multirole Light Combat Aircraft being developed by Hindustan Aeronautics Limited ( HAL ) . India is one of the largest importers of weapons in the world and the LCA Tejas is a major achievement towards the self-reliance in defence production.After India ’s independence in 1947 , The Indian government started the process of building its armed forces in response to the geopolitical situation prevailing at that point of time . The threat perception from Pakistan on Kashmir issue and unresolved boundary dispute with China were potential conflict areas. Pakistan had already made three unsuccessful attempts to capture the Kashmir, which were defeated by the Indian army . The Indian defence planners soon realized that India must develop necessary technological base and expertise in building indigenous weapons manufacturing capability to achieve its long term strategic objectives. The Indian defence planners were always keen on building indigenous weapons manufacturing capability . Although India procured weapons mainly from the erstwhile Soviet Union ( USSR ) . The USSR also helped India in building the indigenous manufacturing capability. Pakistan, on the other hand, had easy access to the latest American weapon systems which Pakistan mainly used for wedging a war against India. India’s first Central Aircraft Manufacturing Company ( CAMCO ) was established as Hindustan Aircraft Limited ( HAL ) in Bangalore on the 23 December 1940 in Banglore as a private enterprise . The HAL was owned by Mr Walchand Hirachand who became the Chairman of the company . Later on, then the Indian government ( British ) acquired a one-third stake in this company . After India’s independence in 1947 and which led to the establishment of Government Of India, the management of this company was transferred to the newly appointed Government of India. The HAL facility during the first few decades in post-independence was mainly used for assembling the fighter such as MIG 21 , MIG 23 , MIG 27 planes acquired from the Soviet Union . The Indian government appointed a committee to explore the possibility of designing and manufacturing an indigenous fighter plane to meet the IAF requirements. Based on the recommendation Of Aeronautics Committee, The Indian government accepted the proposal in 1969 to allow the Hindustan Aeronautics Limited ( HAL ) to design and develop a modern fighter plane for IAF with a proven engine. Accordingly, The Indian government also established the Aeronautical Development Agency ( ADA ) in the year 1984 to manage the LCA Tejas project ( LCA – Light Combat Aircraft ) . The ADA is a national consortium of over 100 defence laboratories, industrial organizations, and academic institutions responsible for developing various technologies necessary for the development of the LCA project. Whereas the HAL would function as a lead principal contractor. The first Russian fighter planes used by the Indian Air Force ( IAF ) mainly consisted of MIG 21 which form the bulk of the IAF fleet. These planes were due for retirement by 1990. However these planes are still in service with IAF due to delay in procurement of planes which were suppose to replace them . The primary objective of the LCA project was to design and develop indigenous fighter place with contemporary latest technology which can be used to replace the ageing squadrons of MIG 21 due for retirement by 1990 . The second objective of the LCA program was to develop the technological base and develop the indigenous manufacturing expertise for future needs. The Indian government appointed an LCA production review committee to access the status of infrastructure necessary for the production LCA program . The review committee gave go ahead after assessment . In the meantime the LCA design specifications were also finalized in 1990 . The HAL decided the build two technology demonstration vehicle TD1 and TD2 which will be based on tailless delta wing aircraft with relaxed static stability ( RSS ) and control-configuration for enhanced manoeuvrability. This design is similar to French Mirage 2000. The LCA Tejas will be powered by a single GE-404 engine which is an afterburning turbofan engine which generates a thrust of 85 KN . 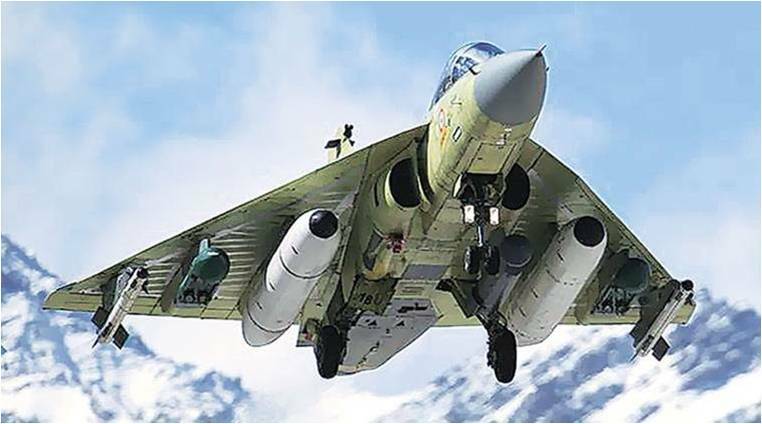 It has a maximum take-off weight of 13.5 tonnes .The LCA Tejas design is based on RSS and needs Fly-by-wire technology which enables the pilot to electronically control the plane through onboard computers. The Fly-By-Wire technology and Multi-Mode-Radar ( MMR ) were the two critical technology areas which HAL required to develop . The Lockheed Martin was contracted to provide technical expertise for the development of the Fly-By-Wire technology. However, this arrangement was terminated due to American sanctions after India’s first nuclear explosion. The LCA Project has gone through a tough time because this is for the first time HAL had worked on such high end sophisticated technology. And therefore, LCA programme was consistently lagging behind the schedule and this also resulted in substantial project cost escalation. The Kaveri engine to power the LCA Tejas . This engine was being developed by Gas Turbine Research Establishment ( GTRE ) a unit of DRDO failed to perform on various parameters . And therefore, in order avoid further delay , a decision was taken to go ahead with American GE F 404 engine and imported radar. However , the GTRE has now resolved most of the problems associated with Kaveri engine with the help of French company Snecma . This company is providing the technical assistance to revive and certify the Kaveri engine project against the offset obligation as a part of the Rafale deal signed with the French government . Since the LCA project was not on the schedule , the Indian Air Force ( IAF ) had left with no other alternative but to extend the lifespan of existing planes with the help of up-gradation. The IAF was heading towards a crises situation due to depleting IAF squadron numbers. The IAF squadron numbers had reached critically low of 32 squadrons as against 42 approved squadrons . This crises situation is caused due to delay in the LCA Tejas induction , phasing out of retired planes and the delay in the finalization of MMRCA deal under which government had started the process to procure 126 multirole fighter plane of 4.5 plus generation. The LCA Tejas prototype building and manufacturing were planned in two phases. In the first phases, two prototypes were manufactured as TD-1 and TD-2 as a technology demonstration vehicle . The wing commander Rajiv Kothyal had the honour to test fly first prototype TD-1 in on 4th January 2001 . In the second phase, some additional prototypes were built for additional testing and development. These prototypes were used to test the development of the final variant especially for Indian Air Force and Indian Navy. The HAL is working on different variants of LCA Tejas. The Indian Air force has placed three orders with HAL for LCA Tejas . The first order will be for LCA Tejas planes with Initial Operational Clearance ( IOC ) standard aircraft . The second order for LCA Tejas will include another 20 with Final Operational Clearance ( FOC ) standard aircraft to be delivered before 2016. However, out of a total 20 IOC planes (16 fighters and 4 trainers) , only 9 Tejas planes have been delivered by HAL to IAF till date. The production of remaining 11 IOC planes and that includes 7 fighter plus 4 trainer aircraft are under production at HAL. The production for 20 Tejas planes with FOC have been delayed as FOC – Final Operational Clearance is still awaited from Aeronautical Development Agency ( ADA ) for which is expected by December 2018 . The principal decision-making authority, Defence Acquisition Council ( DAC ) under the Ministry of Defence has already cleared the acquisition of 83 LCA Mk1A for the Indian air force ( IAF ) . The HAL has already submitted the quotation which is under review . These 83 Tejas MK1 A will be in addition to the 40 Tejas planes ( 20 IOC And 20 FOC ) already under production. The LCA Tejas MK1A is going to be an improved and further optimized version between LCA Tejas MK1 And the MCA Tejas MK2 ,which is currently being designed . The LCA Tejas MK1 A will incorporate some important improvements suggested by Indian Air Force. The Indian Air Force had suggested some major improvements in the LCA Tejas IOC configuration specifications. All these total 83 major and minor improvements have been incorporated by HAL in LCA Tejas MK1 A . The HAL as already submitted a quotation for 83 LCA MK1A which is under consideration by the committee appointed to review the price quoted by HAL. As per the indications , HAL would soon be allowed to go ahead with the production of 83 LCA Tejas MK1A. The HAL has also identified private sector companies to offload major part of the production work . This will allow HAL to function as a system integrator and produce 20 fighter jets per year. Israeli Elta EL/M 2052 AESA – Radar . Integration With Advanced BVR – Beyond Visual Range Missiles . New Electronic Warfare Suite . Latest Helmet Mounted Display And Pointing System. The radar is considered to be the eye of a fighter aircraft. The radar performs two important functions , It scans the airspace to track and identify the potential targets and then also guides the missiles to precisely hit the target. The latest generation of radar technology is referred to as AESA – Active Electronically Scanned Radar which does not need a mechanical rotating head to direct the radio waves . In AESA Radar the radio waves are directed electronic which substantially improves the radar performance. HAL is currently developing “Uttam” AESA radar for LCA Tejas which is still under development . And therefore , for the production of the 83 LCA Tejas AK1 A , the Israeli Elta System made EL/M – 2052 AESA radar will be used to avoid any further production delay for 83 LCA Tejas MK1A. The HAL had floated tender and eventually selected Israeli Elta made , EL/M – 2052 AESA Radar for LCA Tejas . Amongst the other two contenders , which includes French Thales made , RBE2 radar being installed on 36 Rafale fighter jets ordered by India and the Swedish group SAAB developed latest AESA radar Raven ES-05 with antenna technology . The HAL finally selected Israeli Elta EL/M -2052 ARSA radar being the lowest bidder and deprived LCA Tejas of being equipped with the Meteor BVR Missile , which is best in its class. The Indian Air Force wanted to have a clear edge in BVR Missile capability for LCA Tejas as compared to its adversaries. And therefore, amongst the BVR missiles being considered for LCA Tejas , the Indian Air Force wanted Meteor BVR missile to be integrated with LCA Tejas . India has already ordered the Meteor BVR Missiles as a part of the weapons package for Rafale Fighter jets . The Meteor BVR missiles with range of over 180 Km are considered to be the best BVR missiles developed by French MBDA amongst the current generation of BVR missiles. However , the HAL has gone ahead and selected, Israeli EL/M 2052 AESA Radar against the Indian Air Force preference for European radar . The MBDA the OEM for Meteor Missiles have refused to integrate Meteor Missiles on LCA Tejas which will have Israeli Elta EL/M 2052 AESA Radar. The Meteor missile on LCA Tejas would have significantly enhanced its BVR missile capability but now LCA Tejas MK1A will have Israeli Rafael made , I-Derby-ER Missile . I-Derby-ER Missile has 100 km Stand Off launching Range. Multi-Range Air-to-Air Missile ( Short / Medium / Long Range ). Missile With Look-Down And Shoot-Down Capability. Missile Can Be Used LOBL / LOAL Modes In Aerial Combat. Missile With Robust Design , High-Performance ECCM . Effective Against Aircraft , Helicopters And UAVs. Simplified integration on Various Platforms. I-Derby-ER Missile Can be Used For Dual use : Air-to-Air & Air Defense. Based on the modification suggested by the Indian Air Force , the HAL has incorporated the changes in Tejas MK1 A and submitted the quotation for Rs.463 Crores each plane. The price quoted by HAL for LCA Tejas MK1 A is even higher than Gripen, F-16 and Sukhoi 30 MKI . And therefore, the Ministry Of defence has put on hold the contract awarded to HAL for the production of 83 LCA Tejas MK1 A. The government has now appointed a review committee which will review the price quoted by the HAL and till that time this order for 83 Tejas MK1 A will be on hold . The Tejas MK2 is now being designed by the Aeronautical Development Agency ( ADA ) , the design agency for the Tejas series indigenous fighter plane being designed for IAF . The Aeronautical Development Agency ( ADA ) would soon be completing the task of finalizing the design and specifications for MCA Tejas MK 2. The new Tejas MK 2 is going to be a completely new plane packed with major improvements. The MCA Tejas MK2 is being designed as medium category combat aircraft instead . These major improvements include new GE F414 after burning engine which provides 98KN thrust . This will significantly improve the Tejas MK2 weapon payload carrying capacity and expected to have a maximum take-off weight of 17.5 tonnes. This is a major improvement of over 85% in weapons and payload carrying capacity as compared to that of LCA Tejas MK1A . The LCA Tejas has travelled a long distance in thirty years . The critics might point fingers but LCA Tejas is now a success story . The LCA Tejas is an important milestone in India’s resolve to take concrete steps towards self-reliance in defence . The Tejas was indeed an ambitious project for HAL and other defence institutions especially when you need to develop each technology from scratch without any prior experience and foreign assistance . And therefore , the HAL must be complimented for all the hard work. The LCA Tejas program has also helped the Indian institutions such as DRDO, HAL , ADA and others to build a technological base which will be well rewarded in future projects. The real challenge as of now is to ramp up the production figures from the current level of 8 planes to 20 Tejas planes per year which will ease the pressure on IAF due to declining squadron numbers . Further , HAL should offload substantial production to private sector companies necessary to ramp up the production figures . Despite the prolonged development efforts and delays , the final outcome LCA Tejas is a 4.5 Generation Multi-Role fighter jet which is going to be the next work-horse for Indian Air Force for the next three decades.